The BEST WESTERN PLUS Suites-Greenville offers guests all the amenities needed whether traveling to Greenville for business or for pleasure. Guests staying with us will receive superior customer service for an affordable price. 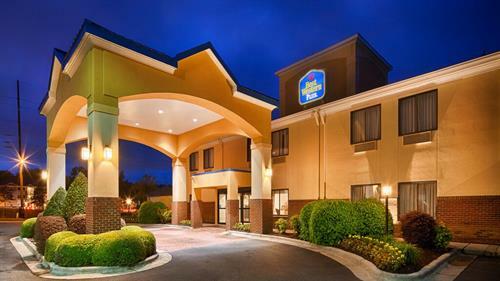 The BEST WESTERN PLUS Suites-Greenville features non-smoking interior corridor accommodations with guest suites equipped with cable television with HBO®, microwave, refrigerator and free high-speed wireless Internet access. Guests will enjoy a free full hot breakfast every morning. To make life on the road in Greenville even more comfortable, the hotel hosts a manager's reception Monday thru Thursday with 2 complimentary beers per guest as well as fresh baked cookies daily and features a fully equipped fitness center. Guests traveling to Greenville on business will also appreciate the business center and meeting space available at the property. Airport and group shuttle also available. When driving NorthEast on Greenville Blvd, the Hotel will be located on the left, just past the 10th street intersection.